Home / Opinion / Will Congress manage its alliances? The Congress is seeking to stitch alliances with like-minded parties before the 2019 polls to oust BJP from power and also to take a lead in uniting the opposition. The question is will it work on the ground? It is too early to predict, as there are many hurdles to building up the opposition unity. Congress insiders claim that the party has realised that it needs to go for alliances. The ‘go it alone’ voices have shrunk because of necessity. Significantly in his presentation to the reconstituted Congress Working Committee recently, former Finance Minister P. Chidambaram said the party should aim to bag around 150 seats in a dozen states where it is directly up against the BJP. In the remaining states, it should aim for pre-poll or post-poll alliances with regional parties to get another 150 seats, which should be enough to form government in 2019. “There will be alliance in each state depending upon the context of the state. The alliance has to be state-specific,” he said. Incidentally, the “Rahul for PM” slogan also has become muted with Rahul himself reconciling to a decision on the prime ministerial candidate after the elections. Congress insiders claim that a broad consensus has been reached on selection of a prime ministerial candidate, as it will be resolved only after the elections. Meanwhile, the Congress and other opposition parties are quietly stitching alliances with regional and other smaller parties in most states. The regional parties together had won 212 seats in the 2014 polls with about 46 per cent vote share. 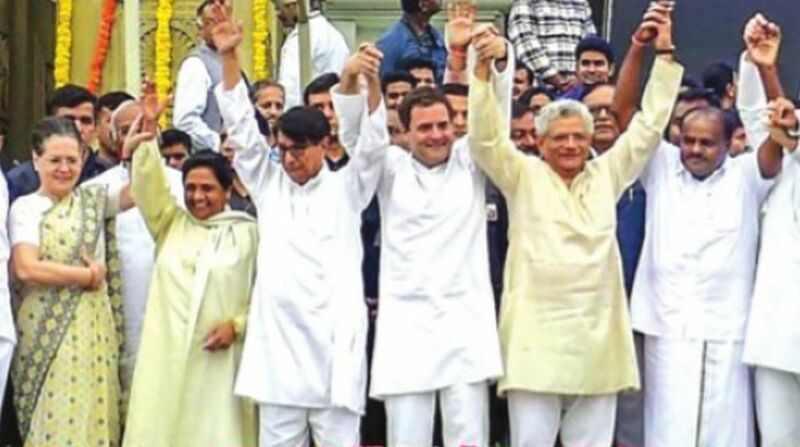 As a first step, the Congress is working for pre-poll alliances in Bihar, UP, Maharashtra, Karnataka, Jharkhand, Tamil Nadu and Jammu and Kashmir, which together account for 255 Lok Sabha seats. The BJP won 150 of these in 2014. Party strategists calculate that the Congress might improve significantly in Rajasthan, Madhya Pradesh and Chattisgarh, where state assembly polls take place at the end of the year, because of the double anti-incumbency faced by the three BJP chief ministers. It also expects that the BJP might lose significantly in UP, Jharkhand, Bihar and Maharashtra. The Congress is already talking to the Samajwadi party, Bahujan Samaj Party, RLD and other smaller parties in UP, which sends 80 MPs to Lok Sabha. 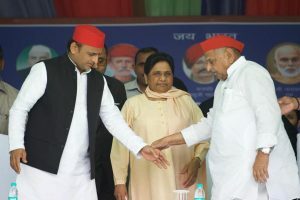 The recent bye-election results, which went in favour of SP, has given them the encouragement to put up a common candidate against the BJP. In Bihar, the 2015 elections and the recent bye-election results have proved that a grand alliance with the RJD and smaller parties could be a winning formula. Here the RJD, Congress, NCP and smaller outfits of Sharad Yadav and Jitan Ram Manjhi could come together. Bihar sends 40 MPs to the House. Tamil Nadu is facing a political vacuum after the death of both its tall leaders – Jayalalithaa (AIADMK) and M. Karunanidhi (DMK) – and an alliance with the DMK will help both the DMK and the Congress to emerge stronger. In Maharashtra, Congress-NCP have in principle agreed for an alliance which could accommodate anti-BJP parties such as RPI (Gavai), Raju Shetty’s Swabhimani Paksha, Bahujan Vikas Agadhi, CPM, SP and RPI (Ambedkar). Last time the NCP and the Congress fought separately. The CPI is willing to join the Congress- NCP alliance provided it gets some seats. This arithmetic will work if the BJP and the Shiv Sena contest separately. The BJP had won 23 seats in the 2014 Lok Sabha polls while the Shiv Sena had bagged 18 seats. In Madhya Pradesh and Rajasthan, the Congress is in the process of finalising alliances with the BSP. In Jharkhand, where BJP won 12 of 14 LS seats, a JMM-Congress- RJD-Marandi alliance will be formidable. The Congress-JD (S) alliance is more or less formalised in Karnataka, where it has a broad seat-sharing understanding despite some strains between the two. In Jammu and Kashmir also, a Congress-NC alliance is on the cards. However, in AAP-ruled Delhi and Congress-ruled Punjab, the state Congress leadership is against tie-ups with AAP. While the united Andhra Pradesh contributed in a big way in 2004 and 2009, the party’s vote base has eroded after the division of the states. Regional leaders in both Telengana and Andhra Pradesh are opposed to Congress. The North-east is lost to the Congress. In such a situation, will the Congress be able to gain? No doubt compared to the NDA, its alliance politics is improving. The BJP has strained relationship with allies such as Shiv Sena Sena and Akali Dal. The Telugu Desam has quit. The BJP not only has to hold on to its old allies but also find new friends. The Congress is depending on the 2004 UPA experiment. But 2019 is not 2004. The change can happen only when the opposition is united and if the people decide they are fed up with Modi and the NDA.